I tend to do Mixed Media on Collages but I also do them in my SOAR Art Journaling and I am starting to learn Mixed Media as far as Drawing, then Inking then coloring Digitally is ALSO considered Mixed Media. Find your niche in Mixed Media and I promise you that you will fall in love with it fast! Penciled Faces, a photo by trishatrixie on Flickr. I am working on my faces more and more to eventually be able to paint them or do other things. I realized I need to be able to have a base for drawing faces first and then I can do the rest. Please check out this link on Stippling. I love stippling and most people think I am a whackadoodle for liking it. It was so comforting to see another female stippler. 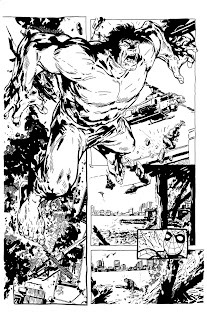 This is a Hulk Inking I did. It took me FOREVER! But I really enjoyed it. If you haven't tried it...try it. I think you either like it, or you don't. Black or white. Yes or no. So to Stipple or not to Stipple? In an effort to get my art more noticed this year I have been doing Challenges and Contests. I saw this contest for a Cute Monster in Deviant Art. I penciled it and inked it. Then I had Cindy scan it in and then I went into Photoshop and worked on coloring it. I forgot nearly everything J taught me, which is like mondo super frustrating, by the way. Normally I would just send it to him, ask him to help and he makes it perfect for me with all the right lines and strokes and then helps me color things in Photoshop. Though I always said "Thank you", it makes me feel like maybe I took his assistance for granted. So now...I'm on my own...I had an idea of what I needed to do, but so wish he had a tutorial of how to convert a pencil/ink into a Photoshop File ready for coloring. Or I so wish I had wrote it down...lol. Having to do this on my own in essence will help me and has helped me grow and learn more about Digital Art and Digital Coloring. I went searching for the knowledge I needed and found a few links to help me out. I have been working on some free classes from Shwe Khit Art and following her Free Tutorials so I am learning and getting a but better on my own...but it is still frustrating to now have to do this all on my own since we are no longer together. I know he said I could talk to him about art, but right now we are giving each other space and I am being boundary thick about that. 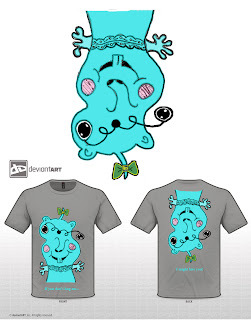 "If you don't hug me..." and the back says "I might bite you"
Would you be willing to click on the link and vote "Id' Wear This" on my Cute Monster T-Shirt to help me make it to the Semi Finals? Anchors of Your Past, a photo by trishatrixie on Flickr. Long Shot of Hope for Love, a photo by trishatrixie on Flickr. Broken Arrows, Hearts & Tears, a photo by trishatrixie on Flickr. 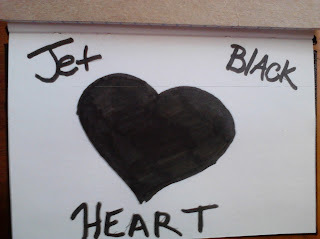 Sketch of the Day "Jet Black Heart"
Was listening to Britt Black and Jet Black Heart came on and I thought That's what I want to sketch AND ink today!! Song is below if you want to hear it and Lyrics are beneath that. As if you didn't know you break my heart each day. Apart of me goes too, and now I know. Apart of me goes too, and now you know. Sketch of the Day "Drowning Deeper"
Sketch of the Day "Walking Through Fire"
I am trying things out like J would do. He used to try out different methods of artist things and see which worked best. I saw he is doing a sketch a day and I thought that might be a nice way for me to keep up on my sketches so I don't have to do a huge blog for Sketchy Thoughts. Plus it keeps me being artistic daily. Now how to share that daily is the thought challenging me lately and right now. One thing I have been doing it just Pencils. But I notice when I send the image no matter if I use my phone or camera they are not easy to see. So today I did something different. I used an ink pen today on top of my pencils. I think it helps so you can see it better now. Then I have been playing around with Photobucket and posting straight to Twitter or messaging the picture from my phone. So far I think I like this method. I take the pic with my phone, then send it to a special Blogger.com email. In the message I put the info that is under the picture. If I want I can do as I am now and Edit the post once on the site. But it is nice to know that if I am not able to, that I can just send the pic and it will post from there. I can post straight to Twitter but this way I get to say a bit about the sketch. So, now I am back to sketching and drawing and challenging myself again through pencils and inks and back to sketching. My little book is almost full and I soon will need more Moleskins to fill. I carry one in my purse and one sits at home by my bed or computer depending on what I am doing. To me these are not really "sketches" yet though they are. 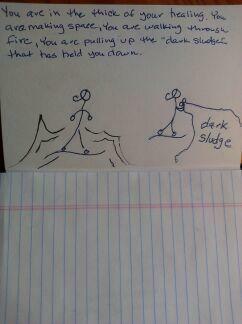 They are artistic representations of my thoughts. Ok, did that sound profound to anyone else but me? LOL. I made a funny. I didn't mean to sound so "deep", but it is true. That is how I feel about them. So, here is round TWO (not to be confused with TOO) of my sketchy thoughts. Enjoy! These first two are random sketches as a reminder for me to Fight the URGE to call, text, email or write love letters to J. FIGHT THE URGE! He doesn't want to hear from me, so I am trying to respect that. Then I thought of the urge like a big monstery blob coming to get me and I have to fight it off. so I re drew it! Then it shows a name tag that says "I am fearful. I am unemployable. I am not good enough." I am worthwhile. I am loveable. I am strong.I am good enough. I am a likeable girl. I deserve to be loved. I am a good person. I am a damn hot attractive 42 year old and proud of it!! Remind myself that "I am NOT the Target"
Realize you have been hit by an Emotional Truck. I could take 5 minutes, 5 weeks or ever 5 years to heal. "Excuse me, but I would like to court you." Person knocking on door. Door sounds say "Knock knock" The Unexpected Blob says "Come in!" 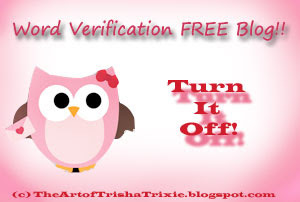 Go ahead and gamble of being our "Authentic Selves" The risk is Worth the Reward. (lft) Person with mouth open-Cough cough, negativity, cough. (rt) Person running away saying "Run, flee the negativity! AUUGH!" Then these sketches are random that came from conversations, etc, misc. I told J I felt like I was waiting for the Bomb to Drop...sadly, then it did. But I am glad it did (no I am NOT crazy) because now I have all the facts.Maybe, just maybe this is the process of the step of on my to healing I needed. I still hurt even more so now that the bomb has dropped. But I can't explain it. I feel "different"
I heard this amazing song today called "Steady Your Heart" and played it over and over like 20 times I think. I cried and cried. I called my therapist. She called me back. I was in "panic mode" I hurt and hurt. Today I thought I was having a pretty good day "despite the bomb" but then I got home and went to do my SOAR homework and someone posted this and I lost it. IT is PMDD week so I am trying to take that into account, but wow...I really need to work on this...Steadying my Heart. this is a Rock with two persons one on each side holding up the heart. Underneath on the rock it says "The Lord is my Rock & my Salvation"
I am working on it. These little sketches sure are helping. It gets those pesky, nasty thoughts out of my head that are roaming and swimming around in there playing racquetball underwater with my thoughts. I hope you sketch or draw or doodle or find a quick release like I have.